A muscular fantasy horror that keeps its nerve and doesn’t let itself down with dodgy effects, this feature debut by British visual artist and pop promo director Corin Hardy (currently working on The Crow reboot) should be sought out by genre fans who like to cast their nets beyond Hollywood. The back-story is drawn from a real-life controversy: shelved plans by the Irish government to address some of the national debt by selling off public forests. In Hardy’s film, an ancient piece of woodland has been sold, and tree surgeon Adam (Joseph Mawle) has moved to the area with his wife Clare (Bojana Novakovic) and baby son to work on the site. The locals are suspicious of the newcomers - but their issue is not so much that their ancestral territory has been flogged to the highest bidder, as that its disturbance is really going to irritate the ancient ghouls and sprites who live in it. Hardy, who co-wrote the screenplay with Felipe Marino, sets up this scenario deftly, without taking the easy route into parody; a brief but very striking turn by Michael McElhatton as the couple’s hostile new neighbour helps immensely. But battles with the locals soon give way to a stand-off with the supernatural, as Adam and Clare face the fact that the local mythology is all too true. The threat itself is a bit confusingly realised, incorporating too wide a variety of ghosts, monsters, parasites and aggressive plant life; and the film occasionally feels repetitive, with a long succession of similar scares and insufficient time for suspense to build in-between. But it has well-judged set-pieces, and original ideas, often small ones: for all that the film has in store for her, one of the most chilling moments we witness for Clare is simply the early discovery of drips of pitch-black goo in her baby’s cot. Screening on Sat 20 and Sun 21 Jun as part of the Edinburgh International Film Festival 2015. 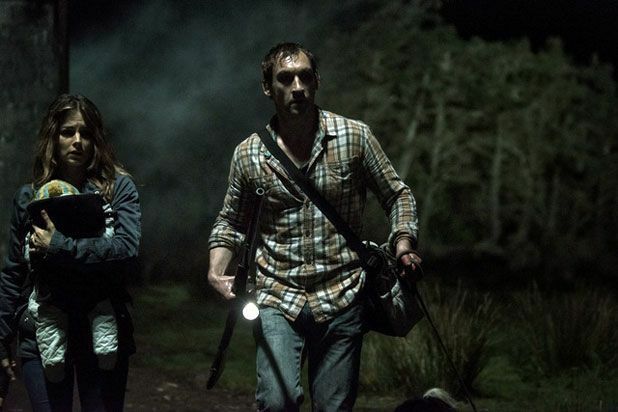 General release from Fri 13 Nov.
Tree surgeon Adam (Mawle) and his wife Clare (Novakovic) move to the countryside so that he can assist with a government deforestation program, but they soon find that local legends about beasts in the woods are true. Muscular fantasy horror, deftly written if sometimes confusing, but with plenty of good ideas.